clipbox is an easy and intuitive to use furniture system which supports the flexible design and transition of living, working and displaying. It specially meets the various needs of temporary use. So iIt’s easy to react on different situations of space such as size and ground plan and the desired purpose. On the other hand the space can also be structured. 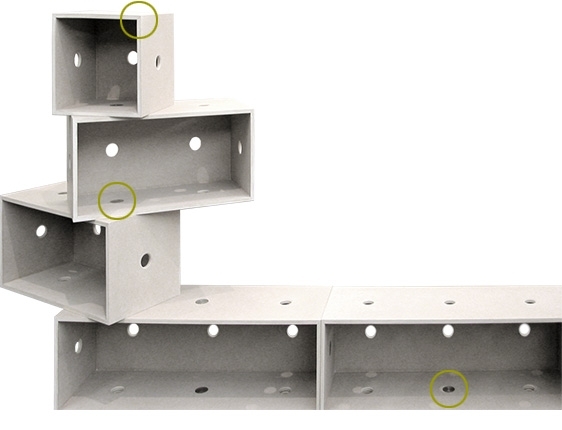 The system is based on modules with shaped holes for carrying and connecting the modules to each other. Every module is attachable and detachable instantly with bolts or just by pressing on special connecting disks. The modules are rotatable while connected. Modifications in constructing all angles, openings and excess lengths in all directions are possible as well as mounting on walls or suspending from ceilings. The system can be completed with desks, drawers, shelves, rods, doors, castors and pivot fees.The modules with back panels can be used to move to other spaces including the content.